The Bull Terrier (also known as an ‘English Bull Terrier’) was bred in England in the 1830’s by crossing a Bulldog with an English Terrier in an effort to build the ultimate fighting dog. 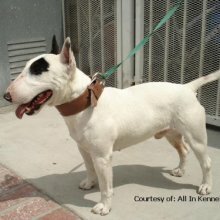 The ‘Bull’ in ‘Bull Terrier’ derives from the popular practice of ‘bull-baiting’, in which several dogs were matched up against a chained bull. The Bull Terrier was later bred with the Spanish Pointer to increase its size, resulting in a highly successful, powerful, persistent fighter. After dog fighting was abolished, Bull Terriers were bred with the Dalmatian to produce a white colored strain, then again with the Staffordshire Bull Terrier to reintroduce color. Both the white and colored types increased in popularity as pets, and both strains remain today. Famous Bull Terriers include the Target mascot ‘Bullseye’, Spuds MacKenzie, who was used in Bud Light commercials (and later discovered to secretly be a female! ), and Patsy Ann, a Bull Terrier from Juneau, Alaska famous for unfailingly predicting the impending arrival of ships to port. The Miniature Bull Terrier was first recognized by the American Kennel Club in 1992. The Miniature Bull Terrier has a shoulder height of 25-35 cm (10-14 in) and weighs 9-16 kg (20-35 lbs). The weight should be in correct proportion to the height. The Miniature Bull Terrier’s head and muzzle are very distinct in appearance--ovular from the profile, with a long skull curving deeply down to the nose with no discernable stop (point at which forehead and muzzle meet). Miniature Bull Terriers have small, deeply set eyes, positioned near the middle. Their ears are small, triangular, and erect. They have short, powerful backs, flat tails and small, round ‘cat feet’. The Miniature Bull Terrier has a dense, short-haired coat. It can be all white (with possible markings on the head), or a solid color with highlights. Acceptable colors are solid black or a mix of tan with either white, red, broken black, or fawn. Miniature Bull Terriers are average shedders, shedding twice a year. Miniature Bull Terriers are happy, comical, and playful, but they are also very stubborn and strong-willed when the mood strikes them. The Miniature Bull Terrier is scrappy, loyal, and eager to defend its owner, but isn’t a bully and will not provoke a fight. Miniature Bull Terriers are lively, brave, tough, and likable. They are strong, but not bred to be guard dogs. Miniature Bull Terriers are happy, comical, and playful, but they are also very stubborn and strong-willed when the mood strikes them. The Miniature Bull Terrier is scrappy, loyal, and eager to defend its owner, but isn’t a bully and will not provoke a fight. Miniature Bull Terriers are lively, brave, tough, and likable. They are strong, but not bred to be guard dogs. The Miniature Bull Terrier gets along well with children. Provided proper social training has taken place, it can make friends with cats or other household pets. The Miniature Bull Terrier may try to dominate other dogs depending on its individual nature and upbringing. It may be an unwise purchase for those who already own a dog. Miniature Bull Terriers should not be encouraged to participate in rough play, and may be too hyper to play with young children. They may become destructive when left alone or unexercised. You can find Miniature Bull Terrier puppies priced from $900 USD to $3500 USD with one of our credible breeders. Browse through our breeder's listings and find your perfect puppy at the perfect price. The Miniature Bull Terrier gets along well with children. Provided proper social training has taken place, it can make friends with cats or other household pets. The Miniature Bull Terrier may try to dominate other dogs depending on its individual nature and upbringing. It may be an unwise purchase for those who already own a dog. Miniature Bull Terriers should not be encouraged to participate in rough play, and may be too hyper to play with young children. They may become destructive when left alone or unexercised. The Miniature Bull Terrier’s coat should be brushed periodically with a rubber brush to remove dead hairs. The ears need to be cleaned on a regular basis. Miniature Bull Terriers should be given a soft place to lie down. Miniature Bull Terriers have a life span of over 14 years and litters of 4-7 pups. White Miniature Bull Terriers should be tested for deafness. Miniature Bull Terriers are susceptible to eye problems, and knee problems like other small breeds. The Miniature Bull Terrier should be given an obedience course when young. Miniature Bull Terriers are very strong when fully grown, which makes them difficult to train as adults. Handlers must be patient and understanding, as the Miniature Bull Terrier learns quickly but has a stubborn streak. The Miniature Bull Terrier loves long walks and running off the leash, but should be watched carefully around other dogs. Miniature Bull Terriers can live happily in an apartment if sufficient exercise is provided. They should be exercised frequently to avoid obesity. Miniature Bull Terrier Puppies for Sale - Shipped Worldwide! Finding the right Miniature Bull Terrier puppy can be dog gone hard work. PuppyFind® provides a convenient and efficient means of selecting and purchasing the perfect Miniature Bull Terrier puppy (or Miniature Bull Terrier puppies) from the comfort of your home, 24 hours a day, 7 days a week. Take advantage of our PuppySearch or leisurely browse our directory of hundreds of dog breeds, Miniature Bull Terrier dog breeders, Miniature Bull Terrier dogs for adoption, and Miniature Bull Terrier puppy for sale listings with photos and detailed descriptions. Some Miniature Bull Terrier puppies for sale may be shipped Worldwide and include crate and veterinarian checkup. Many Miniature Bull Terrier dog breeders with puppies for sale also offer a health guarantee. With thousands of Miniature Bull Terrier puppies for sale and hundreds of Miniature Bull Terrier dog breeders, you're sure to find the perfect Miniature Bull Terrier puppy.